Here are some snazzy birthday facts about 11th of February 1962 that no one tells you about. Don’t wait a minute longer and jump in using the content links below. Average read time of 10 minutes. Enjoy! What day was my birthday Feb 11, 1962? February 11, 1962 was a Sunday and it was the 42nd day of the year 1962. It was the 6th Sunday of that year. The next time you can reuse your old 1962 calendar will be in 2029. Both calendars will be exactly the same! This is assuming you are not interested in the dates for Easter and other irregular holidays that are based on a lunisolar calendar. There are 297 days left before your next birthday. You will be 58 years old when that day comes. There have been 20,887 days from the day you were born up to today. If you’ve been sleeping 8 hours daily since birth, then you have slept a total of 6,962 days or 19.06 years. You spent 33% of your life sleeping. Since night and day always follow each other, there were precisely 708 full moons after you were born up to this day. How many of them did you see? The next full moon that you can see will be on May 18 at 21:13:00 GMT – Saturday. Fun stat: Your first one billion seconds (1,000,000,000) happened sometime on October 20, 1993. If a dog named Tyne - a Gordon Setter breed, was born on the same date as you then it will be 276 dog years old today. A dog’s first human year is equal to 15 dog years. Dogs age differently depending on breed and size. When you reach the age of 6 Tyne will be 42 dog years old. From that point forward a medium-sized dog like Tyne will age 4.5 dog years for every human year. Tiberius Claudius Caesar Britannicus, heir to the Roman emperorship, dies under mysterious circumstances in Rome. This clears the way for Nero to become Emperor. John de Courcy’s army defeats the native Dunleavey Clan in Ulster. The English establish themselves in Ulster. Swaminarayan writes the Shikshapatri, an important text within Swaminarayan Hinduism. American Civil War: United States House of Representatives unanimously passes a resolution guaranteeing noninterference with slavery in any state. BBC Television produces the world’s first ever science fiction television program, an adaptation of a section of the Karel Čapek play R.U.R., that coined the term “robot”. World War II: General Dwight D. Eisenhower is selected to command the allied armies in Europe. Nelson Mandela is released from Victor Verster Prison outside Cape Town, South Africa after 27 years as a political prisoner. What does my birthday February 11, 1962 mean? Your birthday numbers 2, 11, and 1962 reveal that your Life Path number is 22. It is a master number that represents practical idealism and material mastery. You were born under the most powerful and potentially the most successful of all Life Path numbers. The following celebrities also have the same life path number: Chad Allan, Robbie Jones, Claire Trevor, Fess Parker, Terrence Malick, Shawn Crahan, Brad Davis, Shin Dongho, Barry Manilow, Tyler Denk. What is the birthday horoscope for Feb 11, 1962? The Western zodiac or sun sign of a person born on February 11 is Aquarius ♒ (The Water-bearer) – a fixed sign with Air as Western element. The ruling planet is Uranus – the planet of originality. According to the ancient art of Chinese astrology (or Eastern zodiac), Tiger is the mythical animal and Water is the Eastern element of a person born on February 11, 1962. Fun fact: The birth flower for 11th February 1962 is Violet for modesty. 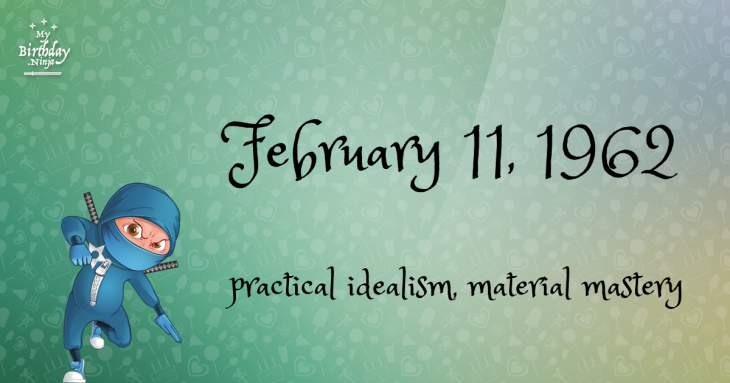 What is the Love Match for Feb 11, 1962? When it comes to love and relationship, you are most compatible with a person born on October 21, 1982. You have a Love Match compatibility score of +190. Imagine being in love with your soul mate. On the negative side, you are most incompatible with a person born on August 4, 1955. Your incompatibility score is -241. You’ll be like a cat and a dog on a love-hate relationship. Arf-arf, I want to bite you. Meow-meow, stay away from me! The number-one hit song in the U.S. at the day of your birth was Duke of Earl by Gene Chandler as compiled by Billboard Hot 100 (February 17, 1962). Ask your parents if they know this popular song. I do not know how you feel about this, but you were a female ♀ in your last earthly incarnation. You were born somewhere around the territory of USA North-East approximately on 525. Your profession was librarian, priest, keeper of tribal relics. How many babies were born on February 11, 1962? Base on the data published by the United Nations Population Division, an estimated 111,558,191 babies were born throughout the world in the year 1962. The estimated number of babies born on 11th February 1962 is 305,639. That’s equivalent to 212 babies every minute. Try to imagine if all of them are crying at the same time. What is the popular baby name on 11 Feb 1962? Here’s a quick list of all the fun birthday facts about February 11, 1962. Celebrities, famous birthdays, historical events, and past life were excluded. 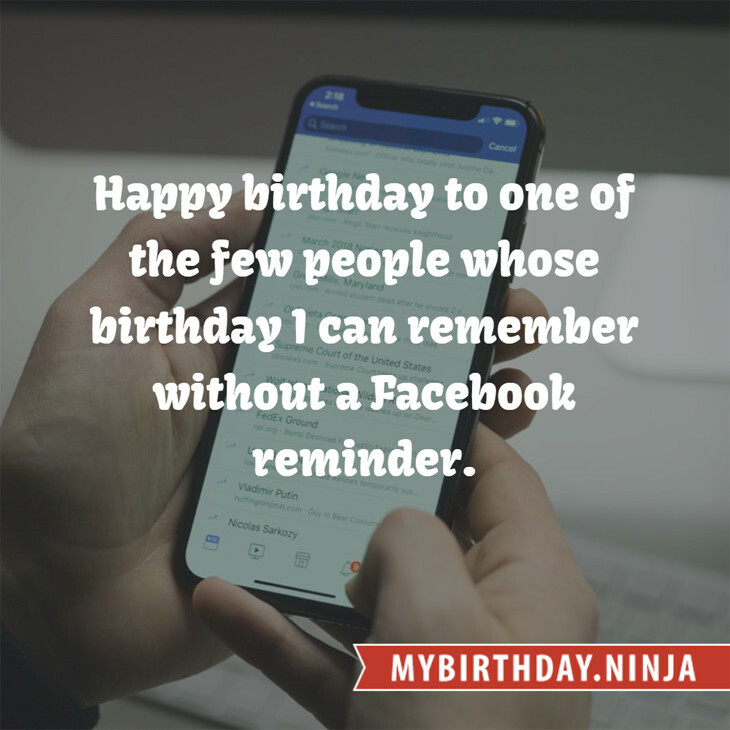 Try another birth date of someone you know or try the birthday of these celebrities: August 18, 1957 – Carole Bouquet, French model and actress; February 12, 1936 – Joe Don Baker, American actor; October 12, 1969 – Martie Maguire, American singer-songwriter, violinist, and producer (Dixie Chicks and Court Yard Hounds).